Put an end to handwritten notes and marked-up paper lists that can be misread or lost between the classroom and the office. Prices start at $199! School Attendance Keeper easily handles attendance requirements of public and private schools of all sizes, and produces attendance reports which meet the legal requirements of the "No Child Left Behind" act of 2001, and virtually all state education requirements. LAN ready with no database server software to install! "The software is working great - a big help to me with attendance!" Keep your school's attendance records precise and up-to-date with School Attendance Keeper. This flexible and easy-to-use program accepts input from multiple users. Teachers enter daily attendance and class attendance right from their classroom by a computer networked to the school's central file server. Links to Awards SAK has won and download sites that feature our software. 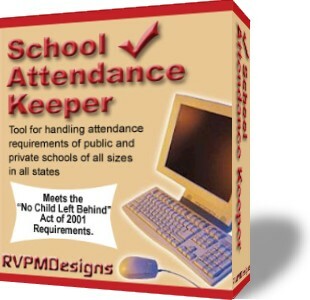 School Attendance Keeper easily pricing meets budget strapped requirements of public and private schools of all sizes. Question: How can we keep these prices so low and stay in business? Answer: We focused on developing a quality program that is well tested. Quality programs with good designs require very little support so our costs are lower and you do not have to be bother with support problems that more expensive program have. In the same vein you need to consider the support you would get from a free or extremely low cost program. hmm..
$199.95 unlimited number of users, classes, less than 200 students. BUY Now! $349.95 unlimited number of users, classes, less than 500 students. BUY Now! $499.95 unlimited number of users, classes, less than 1000 students. BUY Now! $699.95 unlimited number of users, classes, less than 2000 students. BUY Now! 2000 or more students please contact us to request special pricing.